"Your Honor, Years ago I recognized my kinship with all living beings. I am of it, and while there is a soul in prison, I am not free." Eugene V. Debs on his sentencing in 1918 for opposition to U.S. participation in World War I. With the increasingly high profile of Senator Bernie Sanders in U.S. politics, the term "Democratic Socialist" has become increasingly used. Thus it is useful to look at the first person on the U.S. political scene to represent the term. Eugene Victor Debs was born in a family which had migrated to the U.S. Mid-West from Alsace. His father came from a Protestant family devoted to social reform. Thus, he was given his name from those of two writers who were well known for their social reform writings: Eugène Sue and Victor Hugo. From the same Alsace family came his cousin Albert Schweitzer of "reverence for life" fame. 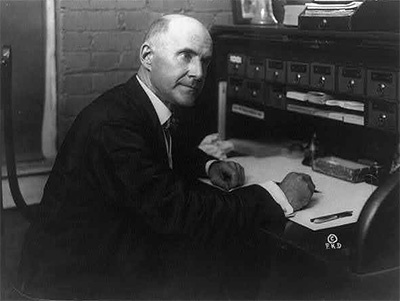 Although his parents were relatively well off in their Mid-West American context, Eugene Debs dropped out of school at 14 years of age and went to work on the local railroad. He realized quickly that the railroad workers were exploited and worked in harsh conditions. Thus, he joined in the early efforts to organize the railroad workers. Although he had only a primary school education, he had a natural talent for speaking and writing. He rose quickly to leadership in the newly-formed Railroad union. In 1894, he was a leader in the American Railway Union strike. President Grover Cleveland called out the U.S. Army to break the strike under the pretext that the train strike was preventing the delivery o mail which is a federal crime in the U.S.A. Debs spent six months in prison and used his time to read. He was ssent books by socialists living in the U.S. including a copy of Karl Marx's Das Kapital. Debs left prison with the conviction that socialism was the reform of the future. His socialism was heavily colored by his Protestant faith although he was never active in church movements. He gained a high visibility in the socialist milieu through his natural speaking and writing abilities. The young Socialist Party decided to present a candidate for election to the U.S. presidency. The U.S. Constitution holds that a President must be born in the U.S.A. Most of the older leaders of the Socialist Party had been born in Europe, mostly Germany and thus could not be a candidate. The U.S.-born Debs became the Socialist Party candidate for the U.S. Presidency for five times: 1904, 1908, 1912, 1916, 1920. In the last two elections, he received about one million votes each time. The 1920 election campaign was particular in that he ran his campaign from his prison cell in Atlanta, Georgia. Debs was very opposed to the U.S. entry into the First World War - " a war to benefit capitalists". He called on men to refuse military service. When the U.S. entered the war in 1917, Congress passed a very harsh Sedition Act. In 1918 Debs was sentenced to 10 years in prison under the provisions of the Sedition Act. The role of presidential candidate for the Socialist Party passed on to Norman Thomas (1884-1968) a Presbyterian minister, who carried on a Christian-colored socialism. Thomas went one round more than Debs, having been a presidential candidate in six consecutive campaigns starting in 1928. Many of the causes for which Debs worked became part of mainstream political thinking: the rights of women, opposition to child labor, the positive role of trade unions. Debs is a father figure for democratic socialism today.